For any who read my book reviews, you notice I read a lot of Western style books. Some of these lately have been a bit on the romance side of things. You know, where the good guy goes off to find out who did what, why they did that to this person, and "Now you're gonna get locked up for being lawless?" But in the end the good guy wins the girl. Even Louis L'Amour, from time to time, wrote books like that. The author of this book I'm reviewing for you has been writing for her children who wanted her stories, not simply stories she'd read to them, such as "The Big Bad Wolf," "Snow White," or even "Cat in the Hat." No, Rachel's children wanted to hear the stories she had within her to tell. I think that's what cued her in on "Well, maybe I should try writing a book." 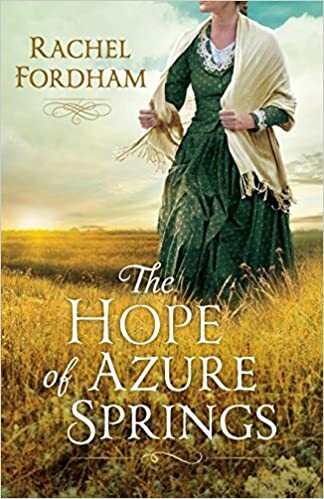 The Hope of Azure Springs is actually her second book she's written. I gleaned this from looking at her website, to be honest. It lists no other book, even before this one that is actually listed, but most writers (including myself) have stories they just haven't released yet. She's no exception. What I can say about this book Rachel has written is that it's well done. She hits the right notes, as far as I'm concerned. It's like she's a skilled artist who paints this rich and lush landscape, and then adds the little things that tell the story. I loved this book a great deal. It's such a wonderful read, whether you choose to savor it or go after it in one sitting, which can be done. I received this book complimentary from Revell in the hopes of an honest assessment of the books they publish.